Instead of the usual front panel knobs and switches, the Axoclamp 900A is controlled by the Axoclamp 900A Commander, a program that runs on a Windows PC computer (see Requirements below) and communicates with the amplifier via a USB 2.0 interface. This control interface reports resistance, voltage, and current measurements and provides automation of Bridge Balance, Pipette Offset, and Pipette Capacitance Neutralization. In addition it has “smart” features that protect cells from potentially damaging signal oscillations and automate mode changes based on internal signal thresholds or externally-applied signals. Amplifier settings such as gain, filter frequency, recording mode and input/output scale factors are automatically telegraphed to the pCLAMP 10 data acquisition software via the USB connection. Although the Axoclamp 900A is a computer-controlled amplifier, the mouse and/or keyboard is not the only means of controlling the instrument. The optional SoftPanel was designed for those who prefer the more conventional feel to amplifier control of knobs and buttons. 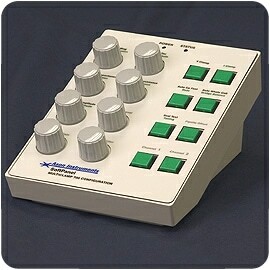 By way of a USB connection, the SoftPanel physically replicates all essential amplifier functions by acting as a hardware extension of the Axoclamp 900A Commander software. SoftPanel knobs replicate continuous mouse controls (“gliders”), while buttons replicate single-click mouse controls. * Two HS-9A headstages (e.g., HS-9A x0.1, HS-9A x1 or HS-9A x10) must be ordered with the Axoclamp 900A. MultiClamp 700BThe Axoclamp 900A is a complete microelectrode current-clamp and voltage-clamp amplifier, useful for a wide range of intracellular microelectrode recording techniques. Like it’s predecessor, the Axoclamp-2B, the Axoclamp 900A has a wide range of functionality and has many enhancements that improve amplifier recording capability, make the amplifier easier to use, and help your experiments last longer. Note: This amplifier does not have continuous single-electrode voltage clamp mode. However, this mode is available in our patch-clamp amplifiers: the MultiClamp 700B and Axopatch 200B. Please see the Amplifier comparison chart for more details on the features of our amplifiers. The Axoclamp 900A Commander program runs on Windows XP/2000 operating systems. Two USB 2.0 ports are required to connect the computer to the Axoclamp 900A: one for amplifier control and one for Monitor signal display on the computer screen for discontinuous modes. An additional USB port is required if the optional SoftPanel is used to control the amplifier. Although the Axoclamp 900A is controlled by a software interface, it remains a conventional analog input/output amplifier. Thus, it requires a separate system for controlling stimulus protocols and recording the output, such as a digitizer and data acquisition software. The Digidata 1550 digitizer and pCLAMP 10 data acquisition and analysis software from Molecular Devices, work together to provide the most complete, integrated solution. * Automatic telegraphing of the Axoclamp 900A amplifier requires pCLAMP 10 software and a Digidata 1550 or Digidata 1320 series digitizer. We also provide a detailed User Guide that serves as a handbook of procedures for microelectrode users. Tutorials written by Axon Instruments staff and scientific consultants provide a useful guide to the operation of the instrument and are informative references for several electrophysiological techniques.